Dell has organized the Virtual Technology Forums slated on 6 days covering various topics on Computing and Technology from May 15 to July 25, 2012. 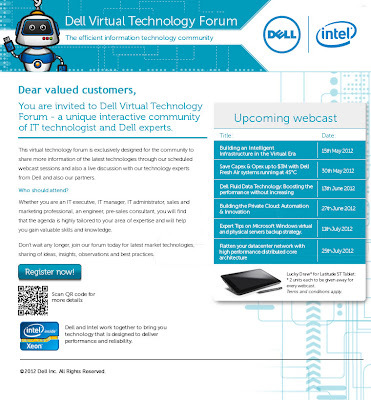 It is a unique gathering of IT technologists and Dell experts to interact online. You can register the topics that interest you the most, or you can choose all in the webcast list. Registration is FREE.